With brilliant orange to red Autumn foliage, Acer palmatum ‘Osakazuki’ is one of the best varieties available. This is an excellent small shade tree for smaller gardens. This is a small growing deciduous tree that will reach around 4 metres in height over time. 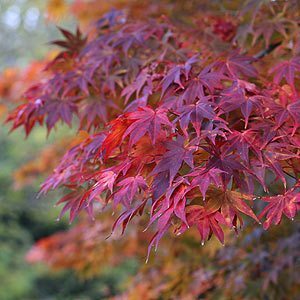 A naturally attractive open growth habit, good green foliage from spring through summer, and brilliant autumn tones make Acer palmatum Osakazuki a great plant pick. Acer palmatum Osakazuki is a very hardy and tolerant tree once established, it does however perform better in cooler climates.In warmer areas protection from the hot afternoon sun will be beneficial. Ensure that drainage is good, in poorly drained soils either amend the soil, or hill up the soil and plant the tree raised a little. Water new plants in well with a liquid seaweed fertiliser. Water well through the first few summers. Acer palmatum Osakazuki is suited to range of landscaping applications. It works well as a feature tree in the garden, or can be used as a background tree in the border. Being reasonably small growing it is also suited for growing in containers in courtyards and similar positions. Excellent when used as a small shade tree. Height – To around 4 – 6 metres in height, depending on climate and soil. Spread – Acer palmatum Osakazuki will form a crown of 4 metres across over time. Position – Full sun to a afternoon shade. Soil requirements – Humus rich moist with good drainage. Foliage – Green and with seven lobes, turning to a fiery orange to red in autumn. Flowers – small red flowers in clusters in spring. Like most Japanese Maples, ‘Osakazuki’ does not generally require pruning and is best left to its natural growth habit. Dead or damaged wood can be pruned way at any time with a sharp clean saw. How much will they cost ? From $40 – 50 for small tree through to $500 plus for a larger 3-4m established specimens. Acer palmatum ‘Osakazuki’ is available for sale from the following participating nurseries.